The logic of this pairing of works on a single disc might not be immediately apparent; one is a cheerful, summery celebration of French peasant life in an almost rustic mass setting, the other a highly sophisticated setting of one of the most searingly powerful of all Psalm texts. But the concealed narrative lies in the duality of composers for each work. Gabriel Fauré and his pupil André Messager shared the task of writing a Mass for the fishermen of the idyllic Normandy fishing village of Villerville where it was first performed in the local church by a choir of 10 female voices, one harmonium and a violin in the Summer of 1881. Giovanni Battista Pergolesi wrote his Stabat Mater in 1735, and while it used to be believed it was written for a performance in the church of San Luigi di Palazzohe in Naples in 1736, recent scholarship seems to think it may have been first performed in September 1735 at the church of San Nicolo alla Carita with which Pergolesi himself was affiliated. Irrespective of its origins, the work rapidly spread across Europe and a copy reached Dresden which Johann Sebastian Bach saw and copied, replacing the Roman Catholic text with the Protestant German version of Psalm 51. This Bach version was first presented in St Thomas’s Leipzig in either 1746 or 1747. The Fauré/Messager work rarely appears on CD – at the moment I can only find three available recordings of it, although there have been others – which may be down to the fact that many of Fauré’s contributions were subsequently turned into his Messe Basse. The ‘Qui tollis’ here – rather awkwardly inserted into a jaunty Gloria - is better known as the Messe Basse’s Benedictus, with Nikolaus Kolb’s charming oboe descant lending it an endearingly innocent feel and putting a very large smile on its face, while the first part of the Sanctus was lifted directly into the later work, and the Agnus Dei is a simplified version of what Fauré put into the Messe Basse. The version recorded here is not the 1881 original but Messager’s subsequent orchestration of it for eight instruments and organ and his division of the vocal line into three female voice parts, which was professionally performed in Villerville the following year. It nevertheless retains a lovely intimacy on this disc, and if the voices sometimes feel a little too exposed and fragile, this only heightens that sense of charming rusticity which pervades the work. Warning. If you play the disc straight through, the lack of any noticeable gap between the end of the Messe and the opening of the Psalm setting is, not to put too fine a point on it, seriously disturbing. That apart, this is a fine recording of the Bach Pergolesi parody, and among the best of a large number which are currently available in the catalogue. From the very outset, Schröfel moves the music along with a purposeful tread and clearly has no intention of wallowing in the pathos of Pergolesi’s original. If anything this is a performance which underlines the Bach element at the expense of the Pergolesi, tracing the flowing lines and inner textural detail with great clarity and adding some pleasing (if not always successfully negotiated) north-Germanic ornaments. 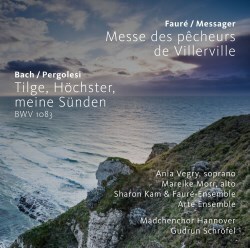 The choir is on more sure and solid ground than they had been in the Messe and the larger ensemble – ten strings and organ – gives much greater weight and substance to the performance while never other than subtly supportive of the voices. The 14 brief sections are divided between the chorus and the two solo voices. Crisply articulated violins pave the way for the gloriously pure and bell-like tones of Ania Vegry as she sings with surprising relish of the guilt she feels for her past “sinful actions” (second section - “Ist mein Herz in Missentaten”), and Mareike Morr positively bubbles along as she proclaims that her sins have made her weak (section four – “Dich erzürnt mein Tun und Lassen”). There is almost breathless spirit as the choir confess that they have been “in sin conceived” (section six – “Sieh, ich bin Sünd empfangen”). One thing Bach cannot be accused of doing here is of reflecting the text in the music; the desire to preserve Pergolesi’s music as accurately as possible often leads to some seemingly incongruous matching of texts with music.